This last week we’ve had quite the cold snap here in Phoenix Metro, which I believe we can actually attribute to El Niño. A few days ago, our state registered the coldest temperatures in the U.S. while everyone else basked in unusual warmth. Hell has frozen over here in Sun Devil country! 1). 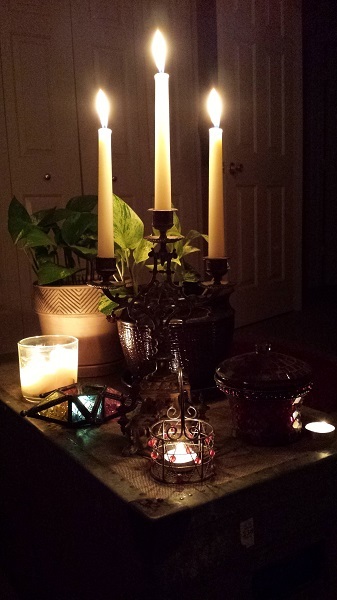 Cold weather means I can light a lot of candles in my office at home. It’s normally too warm for so many candles at once, obviously. 2). Cold weather makes savory, hot food even heartier. 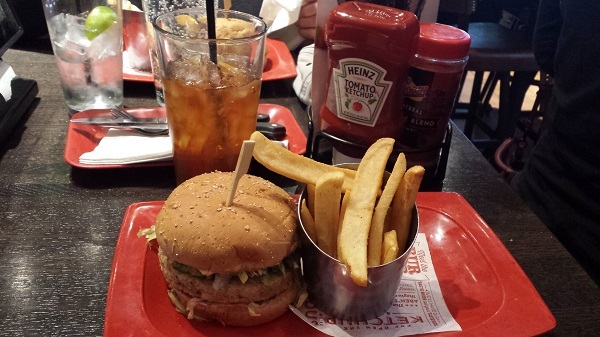 Bocca burger at Red Robin (with iced tea, which I love in all kinds of weather). 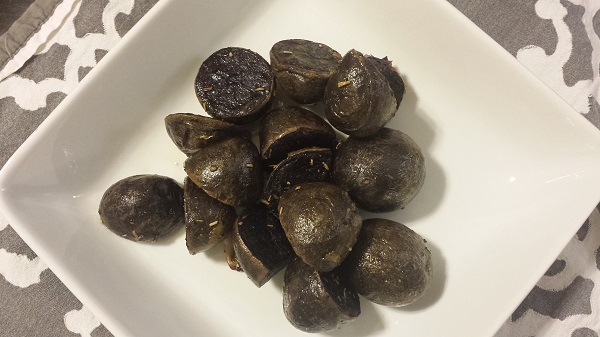 We eat stuff like this year-round, but I find it most fulfilling when it’s cold outside. This particular visit to Red Robin was especially welcome because it was the day after we got back from France, where I’d spent over a week subsisting mostly on salads, bread, and the Larabars I’d packed. Those salads were wonderful, for sure, but by the time we got back I was ready to sink my teeth into something savory and hot! 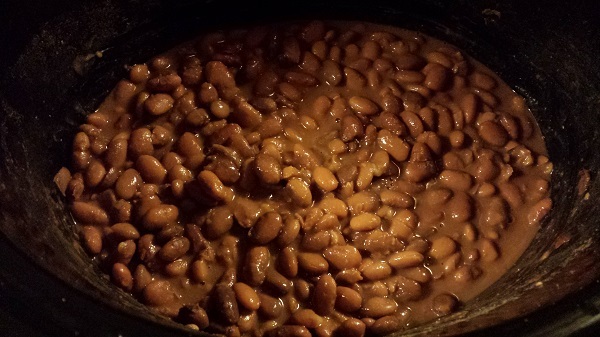 Pinto beans in the slow cooker. Side-note: Did you know that Field Roast makes vegan cheese? I didn’t know until we found it at the store last night. 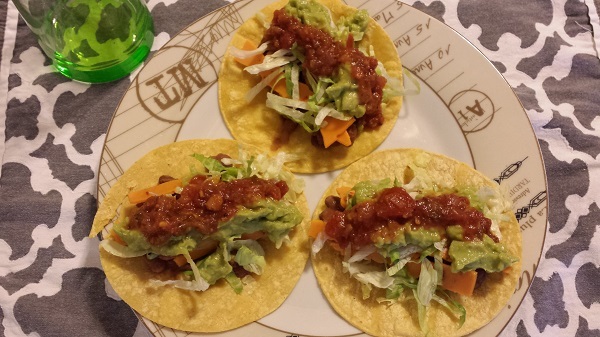 It was great in these tacos! My favorite vegan cheeses have been Follow Your Heart and Daiya, but now there’s Field Roast. Daiya probably still works best on pizza, though. I might have to do an experiment to find out. There are other vegan cheeses out there, too. 3). Cold weather means that chocolate tastes like Christmas. This chocolate is made locally, and it is delicious. 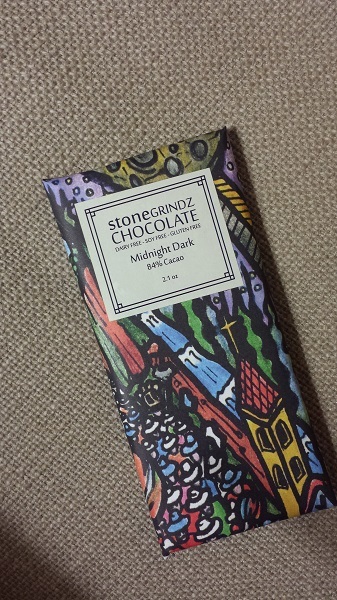 Somehow, cold weather and Stonegrindz’ midnight dark chocolate really go together. Callaghan even likes it, and he generally doesn’t care for dark chocolate! We get it at the Farmer’s Market down the street, of course. 4). Cold weather makes garage workouts possible. 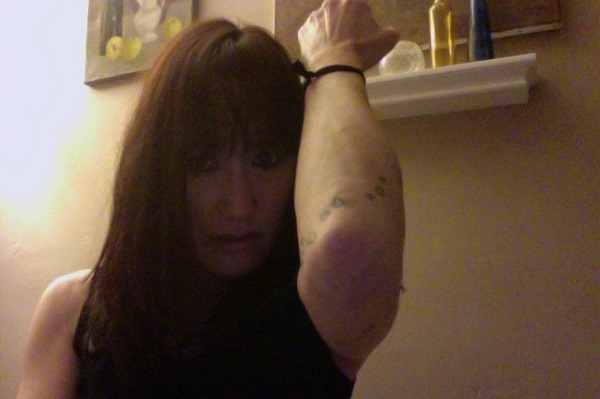 You know it’s been cold if you see that my elbows are bruised… it means that I’ve been working out on heavy-bags in the garage, a thing you can’t do in Arizona heat if there’s no A/C out there. I waited seven months for this. 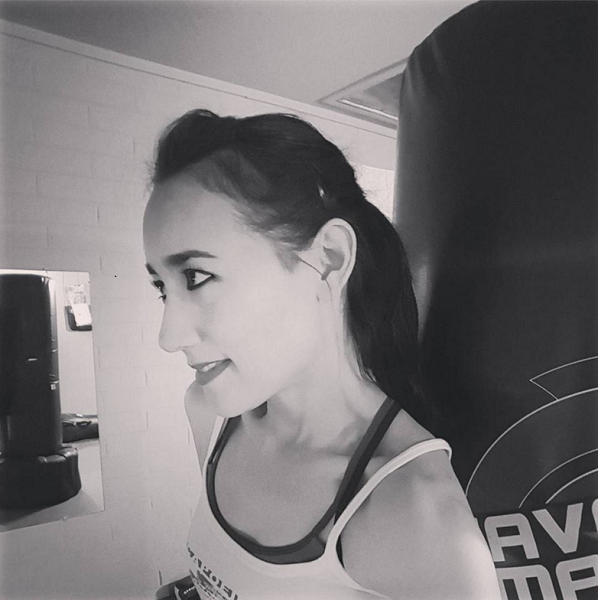 Because let’s be honest… there’s nothing like an intense workout on heavy-bags to relieve your frustrations. Any shrink would back me up on that, I’m guessing. The cold also means that I can lift weights in the garage, since we have some dumbbells out there. I need to build up some strength. 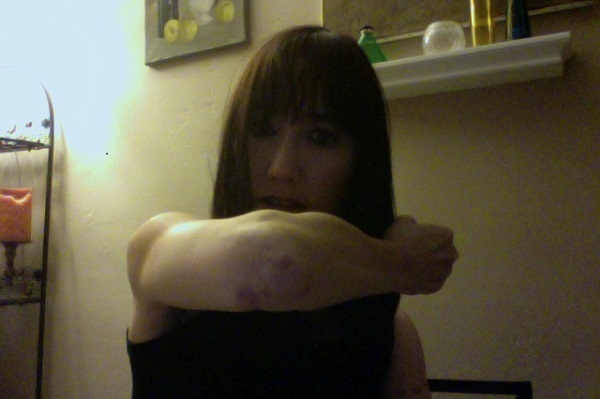 Did I mention, by the way, that my strength-training attempts at the work gym ended in failure? The plan was to go during lunch, but evidently the rest of the world had the same idea. I couldn’t get the weights I needed because they were always in use, and I didn’t have time to wait. 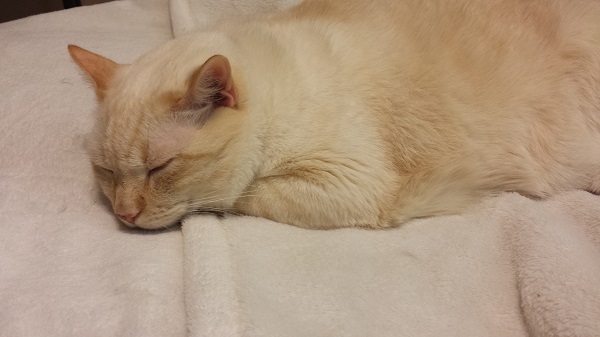 I gave up after three or four days. 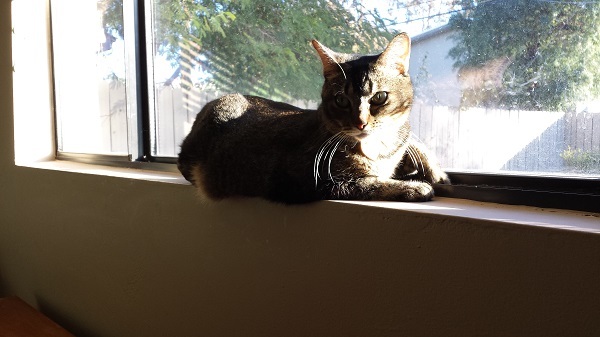 Nenette in her favorite windowsill sunbeam on a cold day. 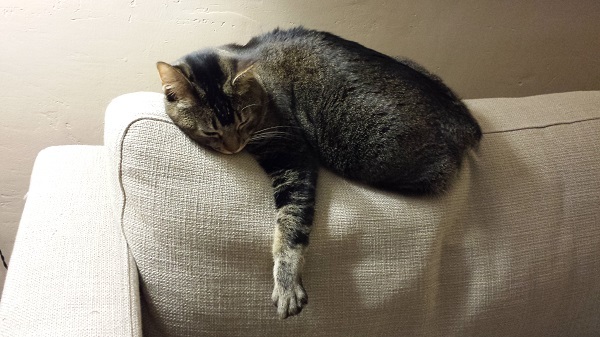 Nenette asleep on the back of the couch, one of her favorite spots. 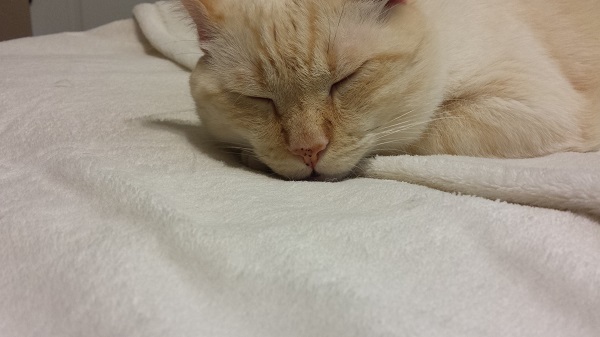 Sleepy Nounours and his little pink freckled nose. It’s supposed to warm up a little starting today, but it’ll still be cold enough to be magical! ← Body Combat in da club.